MOSCOW (Sputnik) - Iraqi legislators from the powerful Binaa bloc on Thursday criticized US President Donald Trump for a surprise Christmas visit to an airbase near Baghdad, saying US troops must leave. "This visit calls into question US military presence and its real goals… All political forces must unite in a sovereign call for an end to suspicious US military presence on Iraqi soil," the bloc’s statement read, as cited by the Alsumaria news channel. Lawmakers from Binaa, led by militia leader Hadi Amiri and former prime minister Nuri Maliki, accused Trump of breaking the diplomatic code and demanded that the US ambassador be summoned. 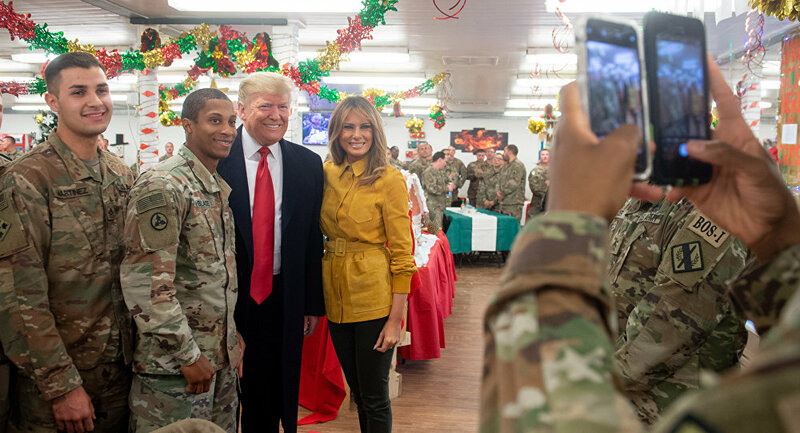 Trump and his wife Melania flew to Al Asad Air Base on Christmas night to thank US personnel for their service, according to the White House. Trump said he did not plan pulling forces – estimated at 5,000 – from the country. US troops have been on the ground in Iraq since the invasion of 2003.